Sleep paralysis is a condition that occurs in the state just before fully awakening from sleep. The condition is characterized by being unable to move or speak. It is often associated with a feeling that there is some sort of presence, a feeling which often arouses fear but is also accompanied by an inability to cry out. The paralysis may last only a few seconds. The experience may involve visual, auditory, or tactile hallucinations. Sleep paralysis is a symptom of narcolepsy, it is also common in healthy people. Surveys from different countries show a estimated: 20 to 60 percent of the normal adult population has experienced sleep paralysis at least once. Around 5 percent of the population has experienced one or more of other disturbing symptoms associated with the disorder. The most common effects include visual hallucinations, such as shadows and light or a human or animal figure in the room, and auditory hallucinations, such as hearing voices or footsteps. Sleep paralysis is thought to be due to mechanisms in the brain stem, particularly the vestibular, reticular, and oculomotor neurons, which prevent bodily movements, block sensory input and provide the forebrain with the internally generated activity that characterizes brain activity during REM (Rapid Eye Movement) sleep. This is thought to be normal part of dreaming and necessary to prevent the body from movements caused by dreams. Eyes however are not paralyzed by this system. Sleep paralysis is due to an ill-timed disconnection between the brain and the body. Sleep paralysis occurs when the brain is awakened from a REM state into essentially a normal fully awake state, but with the bodily paralysis still occurring. This causes the person to be fully aware, but unable to move. If we were not in a state of paralysis while dreaming, we would attempt to act out our dreams. The original definition of sleep paralysis was codified by Dr Johnson as “nightmare,” a term that evolved into our modern definition. Such sleep paralysis was widely considered to be the work of demons and more specifically incubi, who were thought to sit on the chests of sleepers. In Old English the name for these beings was mare hence comes the mare part in nightmare. You can find references to sleep paralysis in the folklore of just about every culture. Folklore in Newfoundland, South Carolina and Georgia describe the negative figure of the Hag who leaves her physical body at night, and sits on the chest of her victim. The victim usually wakes with a feeling of terror, has difficulty breathing because of a perceived heavy invisible weight on his or her chest, and is unable to move i.e., experiences sleep paralysis. This nightmare experience is described as being “hag-ridden” in the Gullah lore. The “Old Hag” was a nightmare spirit in British and also North American folklore. Many new age religions have the theory that sleep paralysis has more metaphysical explanations. Some people believe that when we sleep we are actually involved in ‘astral travel’ or we are having OBE (Out of Body Experiences). The basic premise here is that while we are asleep, our souls leave our bodies and travel to other realms or dimensions. While our soul is out of the body it is possible for something in waking life to bring the body to consciousness but without our soul there to man the ship. Hallucinations, such as shadows and light or a human or animal figure in the room, and auditory hallucinations, such as hearing voices or footsteps and the feel of pressure on their chest making breathing difficult during sleep paralysis may explain tales of ghosts and aliens. The strong sense of a presence, usually harmful, that victims commonly feel during an attack. They also report unusual kinesthetic sensations, such as feelings of being dragged out of bed, vibrating, flying or falling. Many dream therapists believe that sleep paralysis is ideal for lucid dreams because it puts you in a subconscious focus without using visualizations. This is because it lowers your dominant brain wave from your usual alpha range (around 12 to 30 Hz) to a theta range (around 3 to 7 Hz). This puts you in a subconscious focus which is exactly what you need to have lots and lots of lucid dreams and OBEs. Sleep paralysis is a common sleep disorder, yet often one of the most frightening. Sleep paralysis occurs when we wake up mentally-only to discover that our bodies are still sleeping and we can’t move. To make matters even more confusing, our awakening from REM sleep typically is only partial. This means we tend to have long and confusing dreams about being paralyzed, and, because we feel vulnerable, we often dream of being attacked. But we can’t move, nor can we cry out for help. Sleep paralysis is harmless, it can be terrifying, especially if you don’t know what’s happening to you. Someone experiencing an episode may have hallucinations, or have the feeling that someone is in the room or sitting on his/her chest. Hearing and smell can also be involved, as can the feeling of floating or flying. Irregular sleep habits, fatigue and sleep deprivation are all considered to be predisposing factors to sleep paralysis; this may be because such events disrupt the sleep-wake cycle, which can then cause sleep-onset REM periods. In other words, you experience just a piece of REM sleep. Sleep paralysis is five times more likely to happen to people sleeping on their backs, facing up. Drugs such as prozac have been found effective in controlling sleep paralysis attacks. 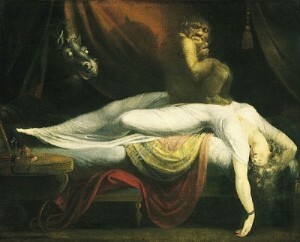 Although most sleep paralysis episodes do not include the visual apparition, more than enough do include it to account for all reported nocturnal assaults. Sleep paralysis is well understood, well documented, and is an accepted psychological phenomenon among almost all medical professionals. Stopping sleep paralysis is about avoiding things that are likely to affect your sleep pattern. Try avoiding smoking; drinking alcohol or taking in caffeine just before you sleep. Do sleep in a room that is able to keep light and sound out. These are just a few things that you can do to alleviate the condition. If you are interested in stopping sleep paralysis then you must combine these methods and techniques into a comprehensive program and routine that you can follow.